Established in the year 2003, we, “Bond Well Ortho Products”, are profound organization engaged in manufacturing, supplying and wholesaler a comprehensive range of Orthopedic Instruments. Products included in this range are Spinal Implants,Locking Plates, Orthopedic Implants and others. Products offered by us are manufactured using optimum quality raw material which is procured from authentic sources of the industry. In addition to this, we employ the latest technology and other necessary amenities in designing these equipment, in strict compliance with medical guidelines. Our range is widely appreciated for its dimensional accuracy, robustness, resistance against corrosion, excellent strength, reliable performance, functional efficiency and durable standards. We have a sophisticated infrastructure, spread across a vast area of land, well furnished with the latest technology and advanced amenities, which are required for manufacturing and delivering a flawless range of products to our esteemed clients. In addition to this, we have divided the entire unit into various segments, in order to accelerate the production process and meet the requirements of the clients in a timely manner. Furthermore, all these departments are handled and managed by a team of highly competent and qualified professionals, who hold a vast industrial experience and are thorough with the trends of the market. These experts make optimum usage of all the resources which are made available to them in the most effective manner, in order to remain ahead in this highly competitive industry. Besides this, we make sure to upgrade all our tools and equipment with the passage of time, in order to deliver only defect-free range of products to our clients, thereby being able to serve them in the most proficient manner. Being a quality conscious organization, we ascertain to test the quality of the entire range before delivering these products to the clients end, in order to ensure their quality and compliance with highest standards. Under the able guidance and expertise of our mentor and Manager, 'Mr. Mahesh Sisara', we have been able to cater to variegated requirements of the clients effectively. Owing to his able managerial skills, in-depth knowledge about this domain and vast industrial experience, we have been able to carve a niche for ourselves successfully in this industry, thereby being able to stand efficiently by the expectations of our clients. Manufacturing and Trading of Orthopaedic Instrument. Bond Well Ortho Products would like to stand on first line in manufacturing and marketing of quality product in few years with new product development, quality assurance, productivity and competitiveness. We strive to provide highest caliber to our valued patronage, thereby we are exploring the latest and highly advanced product development technology. We foster modern work environment, and our infrastructure is strategically designed to leverage the leading advancements. Further, our in-house manufacturing facilities earned us the repute of most productive manufacturers that are garnering the futuristic needs of health care professionals. "Bond Well ortho Products' mission is to develop new product with competitive price without compromise in quality to their esteem customer. To follow latest state of the art technology to manufacturing orthopedic implants and instruments." "We have acquired all in house facility for manufacturing quality implants and Instruments." 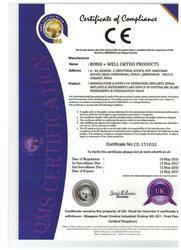 We have received a quality certificate for the product line of orthopaedic implants by UK Accredition Board. 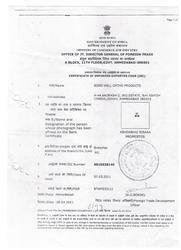 Certificate of import export code by Ministry of commerce and industry. 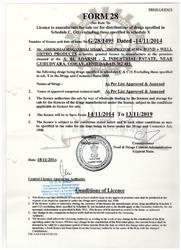 We have received a License for sale of Drugs specified in schedule C,C(1). Our team is backed with outstanding operational skills and wealth of industrial expertise. We recruit and train professionals with incredible potentials to fulfill our pledge of innovation and excellence. We strive to be in the leading lights for developing much anticipated implants designs and owing to the dedication and diligent endeavors of our team members we have become a trusted brand entity. Besides, our team comprises of expert R&D professionals, manufacturing specialists, skilled distribution professionals and quality control department. 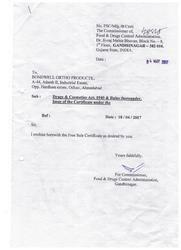 We have received a "free sale certificate " from the Food & Drug Control Administration. From over a decade our brand has become synonymous to quality products, and we have built a huge client base on the basis of our competitive manufacturing and marketing capabilities. Our organization is backed with talent and technology requisite to maintain the total quality management system. Further, owing to the assiduous approach of our qualified leaders we are able to conduct thorough research to develop improved designs of surgical implants. Indonesia,Mexico, USA,Saudi Arabia,UAE,Cameroon,Nigeria,African Countries,Malaysia,Thailand And Asian Countries.